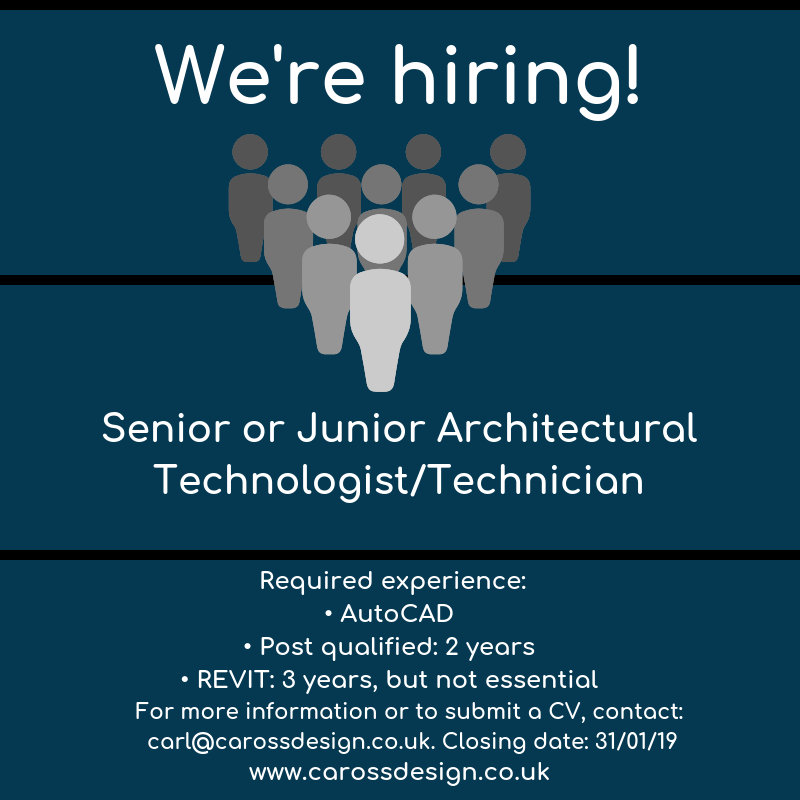 We are looking to recruit a Senior or Junior Architectural Technologist/Technician to join our Teesside-based architectural practice. The practice has successfully completed many projects with diverse uses, such as arts/cultural, commercial, ecclesiastical, healthcare, leisure, research, residential and restoration. Our studio is currently seeking a talented professional with sound technical knowledge to work on our expanding portfolio of projects. Reporting directly to the Director, the successful candidate will demonstrate a good working knowledge and understanding of the industry and be able to work on their own initiative with minimal supervision. Our award-winning architect and director Carl Ross is celebrating over twenty five years in the industry, including ten years at the helm. With a number of award-winning UK projects under his belt, chartered architect Carl is synonymous with a variety of arts, commercial, ecclesiastical, hospitality and residential assignments. After graduating from Hull University’s School of Architecture in 1995, Carl started his professional career at the largest commercial architectural practice in Northern Ireland. Here his projects included Lisburn civic centre, officially opened by Her Majesty the Queen in 2001; Flowerfield Arts Centre on the Causeway Coast; The Braid, Ballymena’s town hall, museum and arts centre and The Bushmills Inn, a four star boutique hotel and restaurant, near the Giant’s Causeway and set in the village that is home to the world’s oldest whiskey distillery. A move back to his native North East in 2003, to take up a position at another private architectural practice, saw Carl involved in numerous other high profile projects in and around Newcastle-upon-Tyne. These included the expansion of Live Theatre on the Quayside; the extensive and sympathetic renovation of Trinity Chambers’ Custom House and master planning for the first phase development of the Stephenson Quarter. However, it was Carl’s desire to be his own boss that saw him at the reigns of his first architectural practice in 2008. Now trading as C.A. Ross Design - formerly Naru and Ross Architects - Carl particularly enjoys transforming spaces in his native North East. On top of this Carl and his team have helped to design numerous North East eateries, including Cena Trattoria and Muse Continental Café in Yarm and The Bay Horse restaurant and pub in Hurworth. Carl’s current projects include the restoration and development of a large listed hall in North Yorkshire and the design of a brand new commercial plant and associated office space in Teesside. When Senior Architectural Technician, Dave Stidwell, started work as a school leaver in 1968, measurements were in feet and inches, and technical drawings were still done by hand. 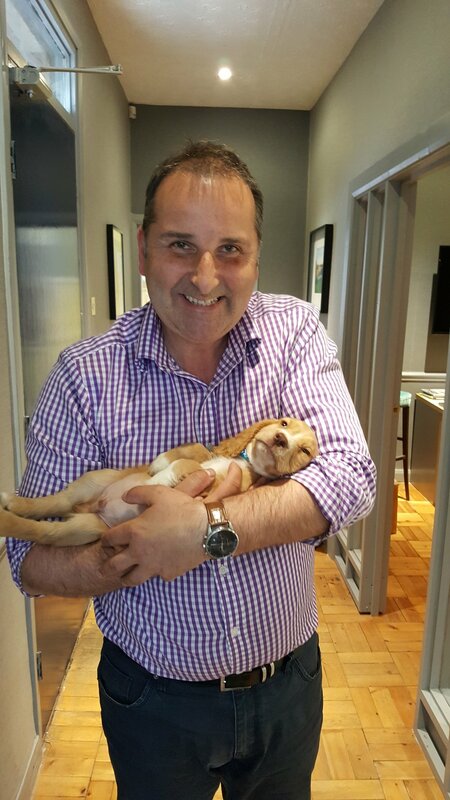 Dave Stidwell, Senior Architectural Technician, C.A.Ross Design - with office dog, Monty! With a passion for architecture and design, and a head for maths and problem-solving, Dave’s first job at the age of 16, was as a trainee technician for private architectural practice, Fred Hedley & Associates in Durham City, where he stayed for three years. 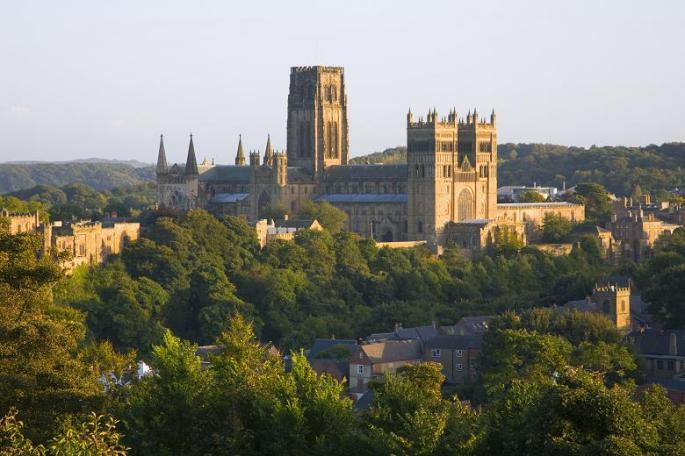 The city of Durham, where Dave worked as a school leaver. This was followed by stints with other private practices and over 15 years in the public sector, working for Sunderland City and Sedgefield Councils in the planning and architectural departments. Having initially gained a Higher National Certificate (HNC) to work as a draughtsman, Dave has embraced new skills and different ways of working along the way. This includes teaching himself Computer Aided Design (CAD) and keeping ahead of changing legislation and new building regulations. Despite living in Singapore for a few years as a child, Dave was born and brought up in the Durham area, where he still lives with his wife Elizabeth. He takes great delight in seeing projects come to fruition, from the initial concept and design stage to the finished article. He especially relishes working on buildings in his native North East. Having joined C.A. Ross Design – formerly Naru and Ross Architects – in 2015, Dave has seen a lot of change throughout his fifty year career. Director Carl Ross is delighted that Dave is such a respected member of the C.A. Ross Design team. Our practice has successfully worked on a diverse architectural portfolio, including arts, commercial, ecclesiastical, healthcare, leisure, and residential assignments. As a result, we need employees who are flexible and have the experience to help bring these exciting projects to life. Dave is a talented professional with sound technical knowledge. What’s more, he has the confidence and competence to use his own initiative, whether it’s preparing and presenting accurate technical design proposals; contributing to the detailed design process; carrying out site visits or preparing drawings, plans and documents for statutory approval. When he's not at work, Dave keeps himself busy working on his model railway and spending time with his three children, five grandchildren and five great grandchildren. We want to let you know about an important change at Naru and Ross Architects. Due to health reasons, Amrit Naru has taken some time away from our practice. Although doing well, unfortunately Amrit will not be returning to us. We know that you will join us in wishing Amrit well for the future. To reflect this change, as of 1 May 2018 we are now trading as C.A. Ross Design. Our office address and contact phone numbers remain the same. We have also switched to a new website address (www.carossdesign.co.uk), plus updated our Facebook and Twitter page names shortly. A popular bistro and cafe in the heart of Middlesbrough’s independent shopping quarter has re-opened following a major refurbishment. With help from Naru and Ross Architects, the new-look Baker Street Kitchen is now open after a major interior makeover. 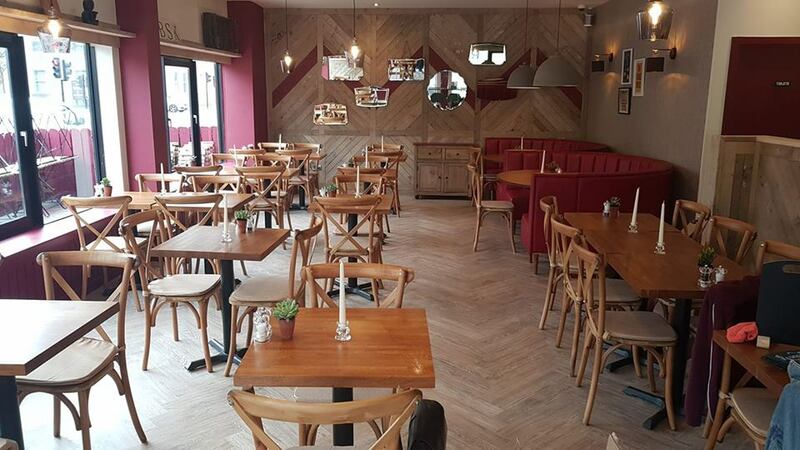 On the corner of Baker Street and Albert Road in Middlesbrough, the single storey restaurant has undergone a Scandi-rustic style transformation, as well as a new layout to the seating, service and washroom areas. Improvements to the main eating areas include banquet-style curved booths in bordeaux upholstery; timber cladding in rustic tones; high and low level loose bistro-style seating in complementary colourways; feature service counters and herringbone plank-style flooring. Indoor planting and hanging greenery have also been introduced to soften the overall look and create a roof-top terrace feel. Although there was nothing drastically wrong with the former interior, it lacked personality, felt cold to look at and echoed as the acoustics weren’t that great. As well as breathing new life into the interior, Baker Street Kitchen has extending its opening hours to capitalise on Middlesbrough’s thriving dining scene. As well as the busy daytime trade, serving favourites such as homemade cakes, cookies, soups, breakfasts, daily specials, coffee and food to go, the restaurant is now open during the evenings and on Sundays to offer bistro and a la carte menus, overseen by a new head chef. Baker Street Kitchen can be found at: Victoria House, 159 Albert Road, Middlesbrough TS1 2PX. It is open from 8am until 7pm from Monday to Thursday, until 9pm on Friday and Saturday and from 10am until 4pm on Sunday. Work on a brand new multi million pound crematorium for the North East is to get underway. The state-of-the-art facility, plus associated landscaped memorial gardens, has been designed by Naru and Ross Architects on behalf of Dignity Plc, one of the largest providers of funeral services in the UK. With planning permission granted by Durham County Council, the new purpose-built facility will be situated on arable land close to a former brewery at Castle Eden in East Durham, just off the A19 dual carriageway. Described as meeting the needs of mourners, but being sensitive to the locality, the £2.5m project will provide a low-level, green-roofed sandstone crematorium building with a link to a separate new-build chapel. Both buildings will be concealed by grass mounding and discreet landscaping, with only a dressed stone flue rising above the low profile of the single-storey buildings. In addition to a new access road and car parking facilities, the three hectare site has been designed to lift the senses with peaceful far-reaching parkland views; beautifully landscaped gardens of remembrance; an ornamental pond and flexible contemplative serene spaces for private reflection. Following a fairly lengthy planning approval period, the project has now reached the tendering stage to appoint a designated contractor. Work is expected to start in the spring, with completion scheduled for 2019. With a number of award-winning UK projects under his belt, chartered architect and director of Naru and Ross Architects, Carl Ross, loves transforming spaces in his native North East. Carl Ross, Director, Naru and Ross Architects. Celebrating over twenty five years in the industry, including five years working under the umbrella of Naru and Ross Architects, Carl is reaping the rewards of building a business from the region outwards. With an office base in a converted Victorian station waiting room on the outskirts of Yarm, Carl has worked hard to gain a credible local, regional and national reputation and has built the practice by recruiting other creative professionals from throughout the North East. As a result Naru and Ross Architects has become a notable presence in providing an integrated architecture and interior design expertise for both commercial and private projects. The company’s wide and varied portfolio includes: Sohe Asian Restaurant Bar and Grill and Haveli Indian Restaurant, both in Newcastle-upon-Tyne; The Crowne Plaza hotel in Gerrads Cross; a £6m rail-served steel distribution centre in Middlesbrough on behalf of AV Dawson and Tata Steel; The Bay Horse in Hurworth; Cena Trattoria and Muse Contintental Cafe in Yarm; St Therese of Lisieux new build church in Ingleby Barwick and conservation projects in privately owned listed buildings such as Sockburn Hall near Darlington. Against this backdrop, Carl has maintained a vibrant, down-to-earth approach to his work. His passion for great building design, reinventing space and re-imagining interiors runs deep. After completing a degree in architecture at Newcastle University, and with an eye for detail and a love of drawing, Carl has an enviable ability to visualise new spaces from a totally blank canvas. And in his spare time: one of Carl's vintage motorcar restoration projects.